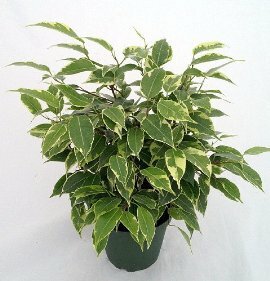 The Starlight Weeping Fig (Ficus benjamina 'Starlight' is a new variegated form of durable green Weeping Fig. Just like it's green counterpart, Starlight prefers very bright indirect light. Keep evenly moist, but not wet or dry. Trim as needed. Left alone the Starlight Weeping Fig can reach 6 feet tall. It makes the perfect house plant. Grown as a bonsai it has small, shiny dark green & cream leaves which are thicker than the standard ficus leaf but thinner than a Jade leaf. Develops a thick trunk and aerial roots at a relatively early age. Very easy indoor care. The tree is one of the best of the ficus for indoor and tropical bonsai. It is tough, durable and responds well to normal house plant care.